On innumerable occasions we've talked about the valuable consumer insights that can be extracted from social data. Within what might be called "social intelligence", the knowledge and insights obtained can be applied to very different areas within a business. 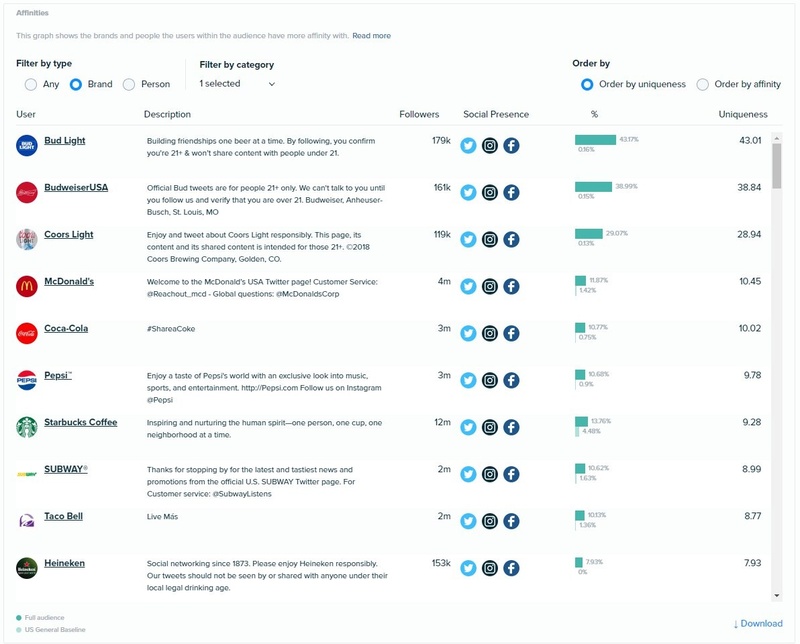 Today we begin a series of publications in which we'll break down how to make the most of social data in the field of competitive intelligence. We focus today on the identification of competitors. Prior to the digital era, market research which included competitor analysis was more complex and expensive than it is today. Nowadays, thanks to social data, companies can count on valuable and precise information about competitor brands or products relevant to the target audiences in just a few hours and at a very reasonable cost. There are two different scenarios that can lead us to identify new relevant competitors that we didn't previously know about, and social data will be what helps discover them. We could define a group of competitors (products, companies or brands) and then carry out an analysis of their audience. Or we could define a target audience and discover those relevant competitors based on the analysis of this audience. We'll develop both examples with a quick and easy step-by-step guide. We believe we're not wrong in saying that there is no brand or company that's not able to list at least five competitors. Knowing about the new players is key for anyone who wants to be really competitive in their sector. In this first scenario, we'll analyze the audience of those known competitors and, based on insights about these consumers, discover the brands and/or products that are relevant to that group of consumers. For this example, let's imagine that the brand Budweiser (in the USA), is a sponsor for the FIFA World Cup 2018, wants to know the most relevant brands of the competition in the sector. Following the steps below, we can obtain this valuable information with just a few clicks and in a short time. 1. Create an audience that includes the audiences of the brands/products of the competition that are already known. In this case, an audience has been created that includes the communities of brands Budweiser, Coors Light and Bud Light. 2. Generate an insights report about the consumer. An insights report for the audience that we created in the previous step is generated, from which we'll be able to extract a lot of key information about consumers in this sector. 3. Analyze the interests of the audience to identify relevant competitors. Within the interests of this audience, brands and products that are direct or indirect competitors can be identified. According to the audience insights report brands in the beer industry such as Heineken, Miller, Coors, Stella Artois, Corona, Carlsberg or Carling are relevant to this audience and as such should be the object of further investigation to obtain the most complete competitive intelligence possible. Other brands of beverages are also identified, although they are outside of the beer segment they could be considered indirect competition, these include: Coca Cola, Pepsi, Mountain Dew, Sprite, 7 Up, Fanta, Lipton Tea, Fit Tea and Tropicana, in the segment of soft drinks; Red Bull, Monster Energy, Gatorade, Vitamin Water and Powerade, in the category of energy and sports drinks; or Bacardi, Captain Morgan and Chivas in the spirits segment. In this second case, the target audience will be identified first, being defined based on established criteria, e.g. demographic data, relations with other users, conversations in which they've participated, personality traits. An insights report is then generated for that audience and the most relevant competitors for that audience can be identified. For this example, we'll continue with the brand Budweiser. Again, following the steps outlined below, we'll obtain the desired competitive intelligence. 1. Create an audience based on the established criteria. The user audience that meets the following criteria is identified: is between the age of 18 and 54 years old, male, living in the USA and is interested in sports drinks (specifically: baseball, basketball, hockey, football and soccer). It's time to create an insights report of the audience that we identified in the previous step with which, in just a few hours, valuable consumer insights will be obtained, amongst which are the interests of that group of individuals and therefore, the brands of the competitors will be included. When analyzing the interests of this target audience, the brands and products that are relevant to this audience and the leading brand of the competitors will appear. Again, brands such as Red Bull, Pepsi, Gatorade, Coca Cola, Mountain Dew, Bud Light, Monster Energy, Coors Light, Powerade, G Fuel, Sprite and Bacardi appear (in this order according to their affinity with this audience). 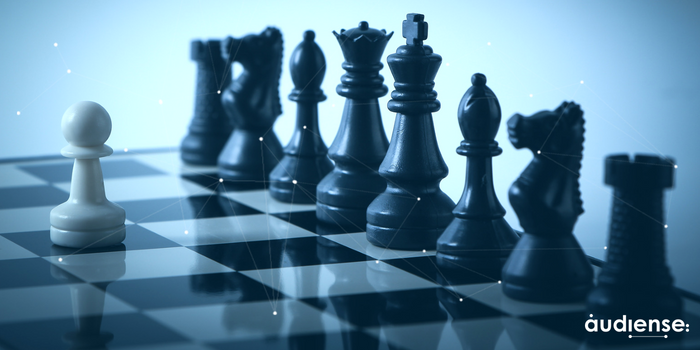 Brands and products that are competitors and are relevant to the target audience that are being analyzed: top-level competitive intelligence insights. As you can see, in just three quick and easy steps we've been able to uncover relevant and valuable information for any analysis of the competition. In addition, the two scenarios are not exclusive but complementary, in order to obtain as many insights about the competitors as possible. If you too want to get the best and most complete competitive intelligence about your brand and sector it's time to start using social data. 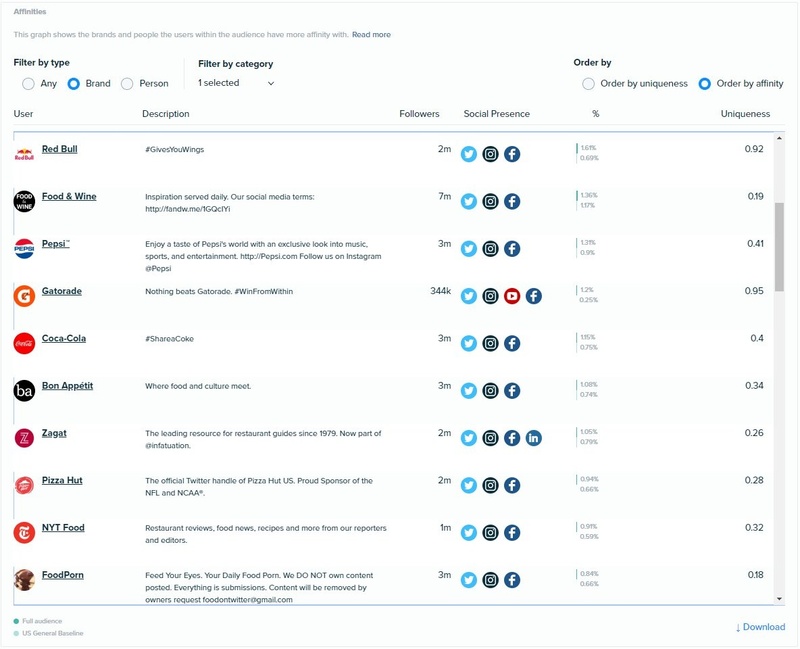 Request a demo of Audiense Insights and discover everything that our platform can contribute to your marketing strategy not only in this aspect but also in many others.